The FTB930/940 series has been discontinued. Please see the FTB1400 SERIES as a possible alternative or contact our Flow Engineering department. The OMEGA™ FTB-930 & FTB-940 Series turbine meters have male NPT end fittings for easy connections. 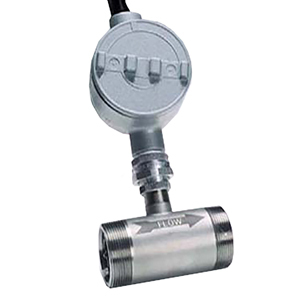 They are suitable for use with gases with a minimum density of 0.025 lb/ft 3 (air at STP is 0.0752 lb/ft 3 ).These units come supplied with a mating 2-wire connector and can be supplied with integrally mounted FLSC-60 Series signal conditioners to provide 4-20 mA, 0-5 V, or amplified pulse outputs. These turbine gas meters are intended for clean service only; where there is any doubt about the fluid, strainers are recommended. Output: 30 mV p-p sinewave min. 참고: Comes complete with operator’s manual and NIST Certificate for air. To order turbine meters with integral signal conditioners, specify model as a system such as : SYS/FTB-932/FLSC-62A. Omega will scale the signal conditioner with the appropriate calibration information from the turbine meter specified. No other calibrations are available.